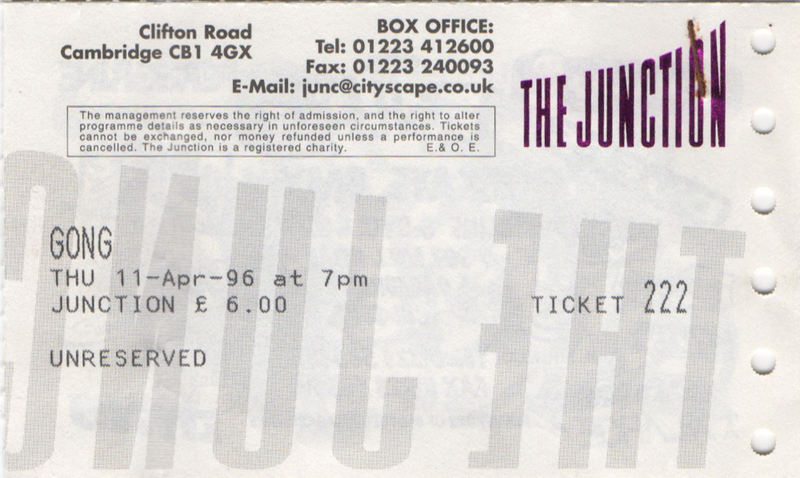 A couple of years after I first saw Gong at the Fridge in Brixton I got to see them again in Cambridge. When the tour dates were announced I figured that given I had a company car at the time and my petrol was paid for by the company it was just as easy for me to go to see them in Cambridge than it was to drive up to London to see them – for a start the Junction had a free car park outside so I wouldn’t have to drive around for ages looking for somewhere to park – the driving times weren’t that much different either! The band by this time included Daevid Allen and Didier Malherbe as it did last time I saw them but Gilli Smyth was now back in the band and with Mike Howlett on bass, Pip Pyle on drums and Here & Now’s Steffe Sharpstrings on guitar it was a good line up!